Aardman Animation Directors Merlin Crossingham and Will Becher will present “The Making of Early Man” from an animation point of view and offer insights into their long careers working in the field of stop-motion animation at the world class animation studio, Aardman Animation. Get a sneak peek at EARLY MAN and get a chance to ask Merlin and Will questions about their work! Due to limited quantity of copies, we will not take book orders over the phone prior to the panel & signing. Please plan to arrive early to purchase. Books are available at first come first served basis. If you do not purchase a book from us for signing, and you bring your own book, then an outside signing fee of $10 will be charged at the door. EARLY MAN is the new prehistoric comedy adventure from four-time Academy Award®-winning director Nick Park and AARDMAN, the creators of WALLACE AND GROMIT and SHAUN THE SHEEP. Shot in Aardman’s own distinctive style, the film will take audiences on an extraordinary journey into an exciting new world, unleashing an unforgettable tribe of unique and funny new characters voiced by an all-star British cast. 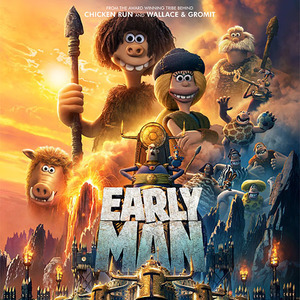 Set at the dawn of time, when prehistoric creatures roamed the earth, EARLY MAN tells the story of courageous caveman hero Dug (EDDIE REDMAYNE) and his best friend Hognob, as they unite his tribe against a mighty enemy, Lord Nooth (TOM HIDDLESTON), and his Bronze Age City to save their home.